When first reading Understanding Comics by Scott McCloud, it was definitely a little troublesome figuring out how to read the comic the right way since it has been a very long time since I last read a comic. As I started to read more and more pages, it became way easier to read since my mind got back on track to the way a comic is supposed to be read. It eventually brought me back to the days when I was a kid reading comics, even though most of the comics that I read when I was younger was more action-based like Marvel or Captain Underpants. After reading this book, I realized that all comics don’t have to be fun or action-packed like I remember as a kid. Comics can be more than that, they can have the ability to convey information that is built into a story, in which almost every comic should have. The fact that comics started around the 1930’s in the United States gaining popularity through action-packed stories, yet people still show hatred towards comics even though I feel like it is just a spin-off to ancient paintings on the walls, just without words. It’s just another way to tell a story or meaning, kind-of like animations how they are a bunch of pictures that barely move just without the bubbled narration (spin-off to stop motion). 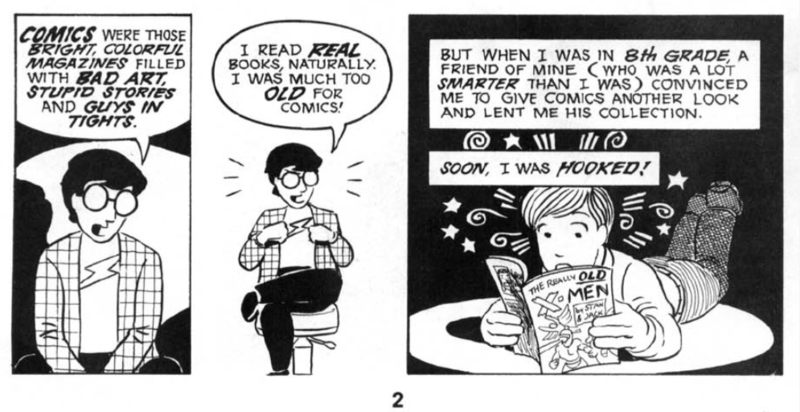 Understanding Comics by Scott McCLoud, Page 2. After reading Eroyn Franklin’s web comics, I thought it was very interesting to see how different it is to read a print comic like McCloud’s printed book than a digital print like the web comics. Because I am always on my laptop, it felt a little bit harder to fully focus when reading the digital comics. When I was reading through the screen it felt like I needed to be doing something else on top of reading whereas when I read a print book, my eyes are glued to the paper. In this digital age, it makes me ponder the idea that since everything school-related seems to keep getting digitized as time goes on, will we just get rid of print books? Everyone has different learning and reading preferences so hopefully we can continue to have both available for as long as possible. If I was going to create a comic, I would create it as a digital material yet easy to read like a print material. Being in the digital age, maybe some comics are too much for the digitized print so maybe making comics that are digitized a little easier to read would be helpful. For my comic(s) I would have them always read left to right and then up to down since that is usually how we read in general here in the United States. Also, I would try to get suggestions throughout the making of my comic because in reality, even though it would be digitized, I would still want readers to not get “lost” like sometimes people do through digital material.